Bring a sophisticated, colonial style to your family room with this upholstered wing chair. Featuring a high seat back and plump t-cushion seat with welt cord trim, this exquisite chair creates a comfortable and supportive seat. Rolled arms and turned bun feet complete the classic look of this chair. Pair with the matching sofa for an inviting room design. The 9710 Upholstered Wing Chair with Turned Bun Feet by Lancer at Town and Country Furniture in the Hamburg, Buffalo, Lackawanna, Eden, NY area. Product availability may vary. Contact us for the most current availability on this product. Create a warm and inviting living room setting with the colonial style of the 9710 series. High wing backs, rolled arms and turned bun legs add sophisticated details that bring a stylish design to your home. Plump t-cushion seats add plenty of comfort that your friends and family will enjoy. With a large choice of fabrics to choose from, you can create a custom look that matches your decor. Coordinating items also available include a loveseat and ottoman. 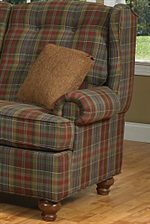 The 9710 collection is a great option if you are looking for Cottage furniture in the Hamburg, Buffalo, Lackawanna, Eden, NY area. Browse other items in the 9710 collection from Town and Country Furniture in the Hamburg, Buffalo, Lackawanna, Eden, NY area.